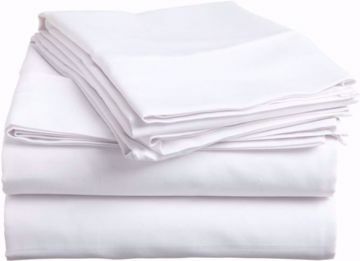 Bed Linen | Bulk Pillowcases | Bed Covers | HY Supplies Inc.
HY Supplies Inc. provides the best quality products, both imported and crafted here in the USA. 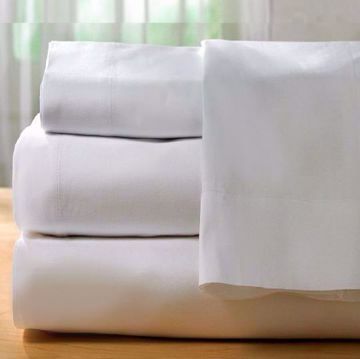 We carry a wide range of linens to meet all of your hospitality and healthcare needs. From the weaving process, all the way to stitching, our imported sheets and pillowcases are carefully inspected to ensure the best quality in terms of whiteness, hand feel, durability, and comfort. Our continuous bleaching process uses hydrogen peroxide bleach to ensure the whitest colour and softest feel. Our product line includes flat sheets, fitted sheets, draw sheets, and pillowcases in the following thread counts and finishes. 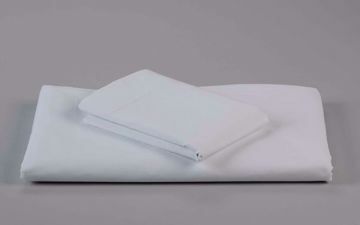 White-T-128 Thread Count, Economy Sheets and Pillows cases, 30% Cotton and 70% Polyester. Ideal use for Healthcare and Hospitality Industry, Stock Subject to Availability, Shipping Varies Based on your location. Our T130 Econolin sheets and pillow Cases are made of the finest quality 30s ring spun yarns, consisting of the most durable blend of 55% Cotton/ 45% Polyester, Ideal use for Healthcare and Hospitality Industry. Made in the USA, Stock Subject to Availability, Shipping Varies Based on your location. Our T130 Econolin sheets are made of the finest quality 30s ring spun yarns, consisting of the most durable blend of 55% Cotton/ 45% Polyester, Ideal use for Healthcare and Hospitality Industry. Made in the USA, Stock Subject to Availability, Shipping Varies Based on your location. T130 Econolin sheets and pillow Cases are made of the finest quality 30s ring spun yarns, consisting of the most durable blend of 55% Cotton/ 45% Polyester, Ideal use for Healthcare and Hospitality Industry. Made in the USA, Stock Subject to Availability, Shipping Varies Based on your location. T130 Econolin sheets are made of the finest quality 30s ring spun yarns, consisting of the most durable blend of 55% Cotton/ 45% Polyester, Ideal use for Healthcare and Hospitality Industry. Made in the USA, Stock Subject to Availability, Shipping Varies Based on your location. T180 Pure Finish sheets and pillowcases are manufactured to the highest standards to ensure the best whiteness, hand feel, and durability. These are made of the finest quality 40s ring spun yarns with a 55% cotton/ 45% polyester blend, Stock Subject to Availability, Shipping Varies Based on your location. White Color, 55% Cotton / 45% Polyester, Stock Subject to Availability, Shipping Varies Based on your location. White Color, A simply better sheet isn't just a brand name, but a symbol of perfection when it comes to the standards of T200 sheets and pillowcases. These have only the most exceptional whiteness and feel. With a crease-resistant finish, these are made of the finest quality 40s ring spun yarns using a 60% cotton/ 40% polyester blend, Stock Subject to Availability, Shipping Varies Based on your location. White Color, Our T250 sheets and pillowcases meet the highest quality and luxury standards of the industry. These bed linens are made of the finest quality 40s ring spun yarns with 60% cotton/40% polyester blend. This product is made with combed cotton and mercerized to optimize the softness, lustre, and strength. White color, Our T250 sheets and pillow cases meet the highest quality and luxury standards of the industry.These bed linens are made of the finest quality 40s ring spun yarns with 60% cotton/40% polyester blend. This product is made with combed cotton and mercerized to optimize the softness, luster, and strength, Stock Subject to Availability, Shipping Varies Based on your location. White color , Our T250 sheets and pillowcases meet the highest quality and luxury standards of the industry. These bed linens are made of the finest quality 40s ring spun yarns with 60% cotton/40% polyester blend. This product is made with combed cotton and mercerized to optimize the softness, lustre, and strength, Stock Subject to Availability, Shipping Varies Based on your location. Misty Green and Jade Green, 55% Cotton and 45% Polyester, Stock Subject to Availability, Shipping Varies Based on your location. White, For customers needing a higher quality in 180 thread count, look no further. Our T180 Elite sheets and pillowcases have a crease-resistant finish which gives them a superior look and feel. These are made of the finest quality 40s ring spun yarns with a 55% cotton/ 45% polyester blend, Stock Subject to Availability, Shipping Varies Based on your location. 55% Cotton / 45% Polyester, Stock Subject to Availability, Shipping Varies Based on your location. Bone Color, 55% Cotton / 45% Polyester, Stock Subject to Availability, Shipping Varies Based on your location.